When President Donald Trump essentially erased the Bears Ears National Monument in Utah, Interior Secretary Ryan Zinke emphasized that the move had nothing to do with oil and gas. Turns out, he was lying. Surprised? Yeah, me neither. 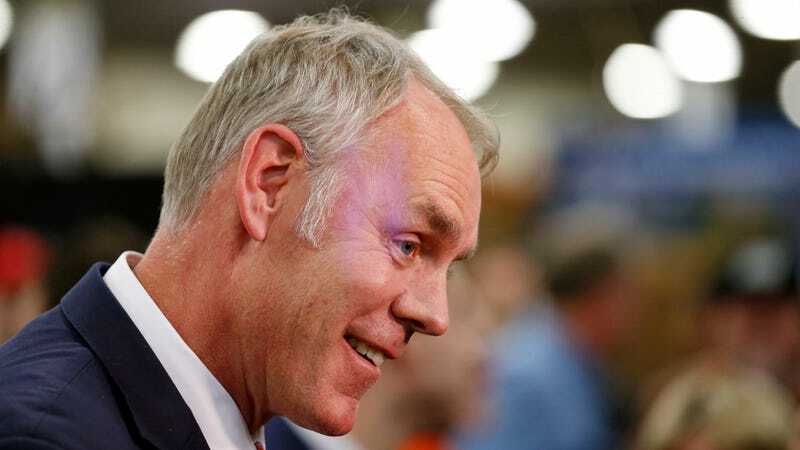 The New York Times reported Friday that oil and gas exploration had, well, a lot to do with the administration’s decision to shrink the monument from 1.35 million acres to a mere 201,000 acres. The Times made this discovery through a public records request lawsuit that resulted in the release of a pile of internal documents related to the monument’s designation under former President Barack Obama and its subsequent revocation under Trump. This map was nearly identical to what the Trump administration decided to cut from this part of Bears Ears. Supporters of the monument, particularly Native Americans, have always been concerned that this decision had to do with industry interests to mine and extract resources from the land, which is considered sacred to nearby tribal nations and is home to more than 100,000 cultural and archaeological sites. Whatever you say, pal. Zinke’s office responded to Earther’s request for comment by writing, in an email, that Zinke took “the views of a variety of interested parties” into consideration when making his recommendation to shrink the monument. OK, then. The Utah state government told The Times that the sale of mineral rights on trust lands helps fund its public schools, which is true. Sales throughout the state have resulted in more than $1.7 billion state revenue, reports The New York Times. The thing is, the Utah School and Institutional Trust Lands Administration, which oversees these lands, also told The Times the federal government downsized the Bears Ears National Monument much more than it had requested. “Obviously they were looking at facts other than the ones we had raised, we assume,” said John Andrews, the organization’s associate director, to The Times. Which facts, though? The facts show that 99 percent of the 1.3 million publicly available comments (roughly half of the total submitted) the department received were in support of Bears Ears National Monument. Other facts include the high potential for oil, gas, and mineral development throughout this region, highlighted in an analysis from the Center for American Progress. “It’s terrible that one letter to the secretary of Interior was more significant and more important than these 2 million voices,” said Cassandra Begay, the tribal liaison for PANDOS, a Utah-based Native-run organization that has been organizing around the Bears Ears controversy, to Earther, in reference to the communications between Hatch’s office and the Interior Department. Begay, who met Zinke in an awkward exchange last year where he told her to “be nice,” wasn’t surprised at all by this news—but she is disappointed and concerned for the land. “Some things like Bears Ears National Monument should be left alone,” she told Earther. Tribal nations—like the Navajo, the Hopi, the Zuni, the Ute Indian Tribe, and the Ute Mountain Indian Tribe—still frequent the land for its other natural treasures: wildlife to hunt, berries to eat, and herbs to gather. When former President Barack Obama designated the monument in 2016, it didn’t include all the land tribes wanted to protect, but it was still a significant chunk. Now, the Bureau of Land Management has approved two uranium mine expansions in Utah—one of which sits right next to where the national monument once existed but not on the designated land itself. Meanwhile, state reps are currently trying to exempt Utah from the Antiquities Act so that there is never another Bears Ears. With that, Begay offers some final thoughts.